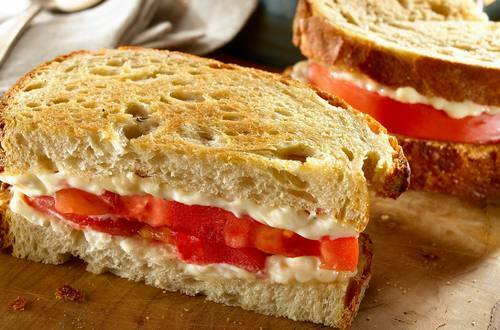 Discover one of racer Dale Earnhardt Jr's favorite family recipes, the classic tomato sandwich with mayo. 1 Combine lemon juice, lemon peel, Hellmann's® or Best Foods® Real Mayonnaise, salt and pepper in small bowl. 2 Cut 8 slices, about 1/2-inch-thick, from center of bread. Toast lightly, if desired. Evenly spread mayonnaise mixture on bread. Top 4 bread slices with tomato, then remaining bread slices, mayonnaise-side-down. To serve, cut in half. Serve, if desired, with chips, pickle slices and/or soup.